This video captures a real rarity: one of the very few times the brilliant Plácido Domingo performed both of the great tenors roles during the same evening at the Met. 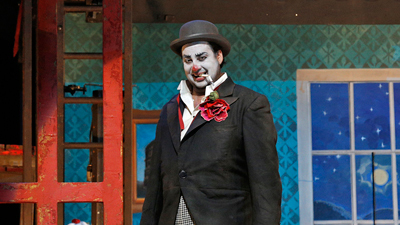 Domingo singing either Turiddu (in Cavalleria) or Canio (in Pagliacci) would be remarkable, but to get both in the same incandescent performance is to see history. With James Levine’s passionate conducting, Franco Zeffirelli’s iconic production, and the sensational singing actors Tatiana Troyanos (Santuzza), Teresa Stratas (Nedda), and Sherrill Milnes (Tonio), these searing one-act operas blaze.